I recently learned about the microbenchmark package while browsing through Hadley’s advanced R programming book. I’ve done some quick benchmarking using system.time() in a for loop and taking the average, but the microbenchmark function in the microbenchmark package makes this much easier. Hadley gives the example of taking the square root of a vector using the built-in sqrt function versus the mathematical equivalent of raising the vector to the power of 0.5. Now, let’s try it on something just a little bigger. This is similar to a real-life application I faced where I wanted to compute summary statistics of some value grouping by levels of some other factor. In the example below we’ll use the nycflights13 package, which is a data package that has info on 336,776 outbound flights from NYC in 2013. I’m going to go ahead and load the dplyr package so things print nicely. Let’s say we want to know the average arrival delay (arr_delay) broken down by each airline (carrier). There’s more than one way to do this. Years ago I would have used the built-in aggregate function. Alternatively, you can use the sqldf package, which feels natural if you’re used to writing SQL queries. Not long ago I learned about the data.table package, which is good at doing these kinds of operations extremely fast. Finally, there’s my new favorite, the dplyr package, which I covered recently. Each of these will give you the same result, but which one is faster? That’s where the microbenchmark package becomes handy. Here, I’m passing all four evaluations to the microbenchmark function, and I’m naming those “base”, “sqldf”, “datatable”, and “dplyr” so the output is easier to read. 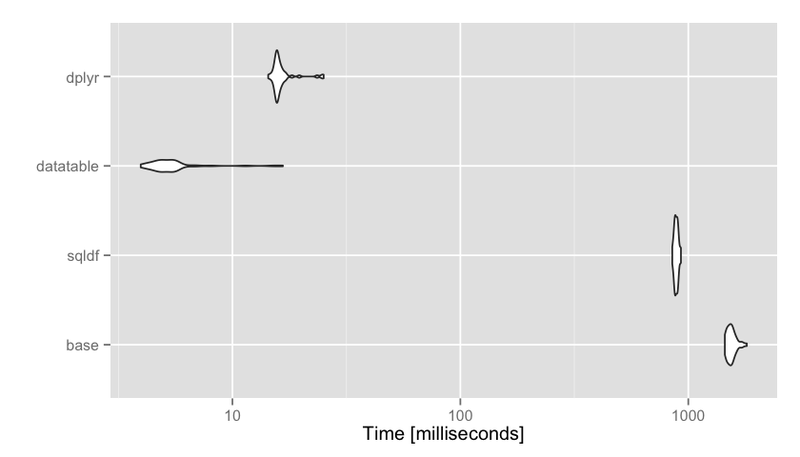 In this example data.table and dplyr were both relatively fast, with data.table being just a few milliseconds faster. Sometimes this will matter, other times it won’t. This is a matter of personal preference, but I personally find the data.table incantation not the least bit intuitive compared to dplyr. The way we pronounce flights %>% group_by(carrier) %>% summarize(mean(arr_delay, na.rm=TRUE)) is: “take flights then group that data by the carrier variable then summarize the data taking the mean of arr_delay.” The dplyr syntax, for me, is much easier to use and extend to much more complex data management and analysis tasks, so I’ll sacrifice those few milliseconds or program run time for the minutes or hours of programmer debugging time. But if you’re planning on running a piece of code on, for instance, millions or more simulations, then those few milliseconds might be important to you. The microbenchmark package makes benchmarking easy for small pieces of code like this. I got around 144 ms in total. Great observation @hanshalbe. Yes, I did give data.table an unfair advantage by pre-converting flights into a data.table outside the benchmarking framework. When you already have a data.table, the mean-by-group comparison is faster, but if you have to create the data.table each time, perhaps it isn't.